Ladies and gentlemen, our heroes. So how does the co-op stand up? Remarkably well, as luck would have it. The co-op campaign takes place after the events in the single-player portion, and stars a pair of absolutely adorable robots named Atlas and P-Body. GlaDOS has assembled a series of tests to prepare them for a mission to “save the humans” trapped in a vault. The plot isn’t nearly as critical to the co-op mode, but it’s nice that a narrative, however simple exists. The puzzles start out easy enough, but eventually ramp up to well beyond the difficulty curve of the single-player portion. All of the mechanics of the solo campaign are present, and the addition of two more portals and the need to maneuver two players through a puzzle greatly expand the number of steps necessary to succeed. 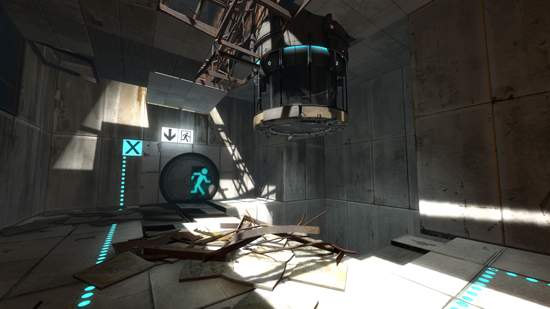 A big favorite in the co-op mode are the puzzles where one player must navigate a section while being guided by their partner, through judicious use of portals. It’s pretty hilarious to launch your partner through a carefully constructed pinball machine of portals, gels and such. Two incredibly handy tools are at players’ disposal in the co-op mode. Since our heroes are networked robots, players can hold the Tab key down and a picture-in-picture window appears, showing what your partner is seeing. As players are often split from each other, this becomes indispensable in working out some of the later puzzle solutions. In addition to this, there is a ping tool that allows you to point out locations of interest, mark where you’d like a portal to be placed, or initiate a countdown for sequences requiring both players to act simultaneously. This helps nonverbal communication tremendously, though I’d REALLY recommend playing with voice communication enabled. 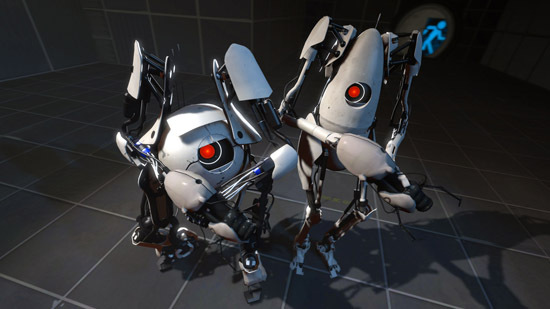 The console versions of Portal 2 include both splitscreen and online play, but the PC version is limited to online co-op. As far as I know, splitscreen players on PC are few and far between, but leaving the option out seems to be an odd omission. PlayStation 3 copies of the game not only include a code to activate a complimentary copy of the game on Steam for PC/Mac play, they also include integration with Steam itself, allowing for a PS3 player to hook up with friends on the PC version and play cooperatively. Look familiar? Congratulations, you played Portal! Setting this up is a cinch. Once you log into your Steam account on your PS3 you simply head over to your PC (or Mac) and enter the code that came in the box. Cross-platform chat works with both voice and text and from either perspective you wouldn’t know who is on which platform save for the “playing on PS3” subtext. The only downside of this method we found is the slower load times on the PS3 hinder PC players a bit. It remains to be seen how in-step the PS3 will get its updates alongside the PC version, but we can only hope for an extension of co-op material. The co-op campaign is slightly shorter than the single-player component, though it benefits from higher density of puzzles. As with the single-player, replayability is an issue, as once you know all of the puzzle solutions there is little impetus to go back and replay them. There’s a central hub room that lets players choose to continue their co-op campaign or go back and play a puzzle they didn’t solve, the host’s progress determines this, but luckily the guest gets credit as well. I would be remiss if I did not bring up the massive achievement in character animation that Portal 2 displays. Wheatley, a character who is simply a sphere, is more expressive than most human characters in gaming. It’s almost astonishing to see what a wide array of emotions he is able to convey. The co-op protagonists follow in his wake, equally impressive because they are unable to speak, yet their emotes speak volumes about their personalities. The voice acting is of superlative quality as well, and though his role in the game is all-too-brief, J.K. Simmons’ turn as Aperture founder Cave Johnson is an absolute gold mine for hilarious quotes. Several members of the Co-Optimus staff have been tossing quips of his around in our private communications. Stephen Merchant is also absolutely pitch-perfect as Wheatley, but the Cave Johnson lines steal so much of his thunder I actually forgot to include this sentence when I originally published the review. Portal 2 is the full-course meal after Portal’s appetizer. While it suffers from a distinct lack of replayability in all of its modes, this is a title that all gamers should experience, and definitely stands as one of the best games of 2011. Just play it... you monster. The Co-Op Experience: Portal 2 will have a co-op campaign. Players take control of a robot and work through puzzles that require two players to work together to solve.